When Catholic Bishop Roger Joseph Foys saw a Catholic boy with a beatific smile, standing athwart an agitated, Amerindian elder and smiling in that pacifist, sweetly Christian way—he and the Diocese of Covington simply had to condemn the kid. Who else? What choice did a man of the cloth have? The same absurdity typified the reaction of the lickspittle liberal mayor of Covington, Joe Meyer. “Appalling,” he called Covington Catholic High School student, the boy implicated in that “daring” standoff, on the National Mall, in D.C.
Had not philosophical giants like Cardi B (once a stripper, now a rapper, always illiterate) and Alyssa Milano (illiterate starlet) shown us the way? Indeed. “The red MAGA hat is the new white hood” was Milano’s catechism. She went on to implicate “white boys’ lack of empathy [toward] the peoples of the world [in] the destruction of humanity.” Only 12 years to go, predicts Comrade Ocasio-Cortez. Does this lily-white lady not know any young boys like Nick? Poor child, Sandmann imagined he was safe, so long as he did the right thing. But then Sandmann discovered he was hated for something he couldn’t right: the color of his skin. And while formative figures around him will hide this fact—for his sake, let us hope young Mr. Sandmann remains hip to it. Failing to pinpoint the white-hot hatred of whites percolating throughout America is to endanger these children, to leave them helpless in the face of unadulterated, dangerous, near institutionalized hatred. The Nick Sandmanns of America are of a culture and a color that dare not speak its name. Anglo-American manly culture is waning fast. But its quiet, steely dignity still lives in this boy’s countenance, in the face of hysteria and malice. Whether you watched the first 3:45 seconds of the film, or sat through two hours of it—there was never any evidence of wrongdoing to excavate. The segment being discussed depicts a noble, not ignoble, reality; one that should be impossible to misconstrue—unless you are part of the corrupt, morally inverse and perverse universe inhabited by America’s cultural cognoscenti. The Covington conflagration was about a virulent and viral social and news media that fakes the news, and that rushes to judgement without the facts. 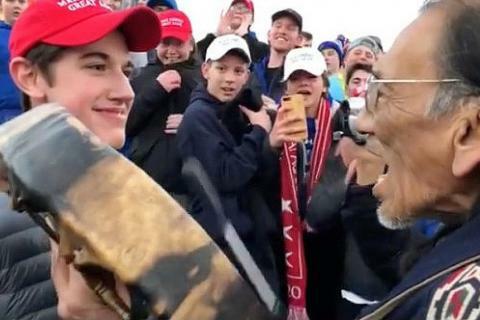 Imagine that those Covington boys were black—conservative, Catholic, pro-life, pro-Trump, black young men, who welcomed with beatific smiles the in-your-face, agitated drumming of an elder Indian. You just know that, were this the case, these black youths would have been praised to the skies. This entry was posted in Current Affairs and Comment, QR Home and tagged Black Hebrew Israelites, Covington kids, MAGA, Nathan Phillips, Nick Sandmann. Bookmark the permalink.